Never, in all the years that I have been in love with Thanksgiving (and addicted to cranberry sauce) have I attempted to make homemade cranberry sauce. That all changed this year when the November/December issues of Vegetarian Times Magazine arrived in my mailbox. Their recipe for Jellied Cranberry Molds seemed so easy that I decided to give it a try. Fresh cranberries in hand, I made the molds this evening in preparation for tomorrow’s Thanksgiving meal. The recipe called for Port wine which I definitely do not have around (too dry for me) but I substituted Cabernet Sauvignon. I know, I know. I can already hear you saying: “Oh, and THAT’S not a dry wine?” LOL. It was an experiment, I won’t buy it again either. After it all cooked down a bit and I worked feverishly to press it through the sieve, I had something that darn near resembled Cranberry Sauce. As suggested in the article, I used mini bundt cake molds, except for Papa’s helping (the one with all the skins and stuff left in the sauce.) I placed that one in a heart-shaped mini mold. Awwwww, how sweet! Surprisingly, the mess was minimal, just a couple of sticky red blobs on my counter….no more than making a peanut butter and jelly sandwich. Those who licked the remains from the mixing equipment seemed to be impressed with the flavor and a check into the fridge an hour later showed the molds to be jellifying nicely. Kudos to Vegetarian Times for coming up with such a great a no-sugar, no-gelatin vegan treat! THANKSGIVING UPDATE: When they say that you should use cooking spray to grease the molds, I guess they mean it. I refused to use that stuff and since my molds were non-stick I just poured the cranberry mixture right into them. 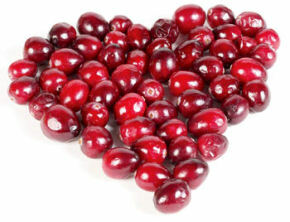 They looked quite jellified but came out, with prodigious shaking, as a cranberry blob. No pretty mini-bundt shaped jelly here, just mush. Suggestion: use either spray olive oil, or switch the agave for sugar which makes a more solid jelly.